So, no that I have a puppy, I get to test all of the puppy products. Most important on my list at this stage, house training pads. Also known as wee wee or pee pee pads. The last review of pads was a super economical brand I bought at Walmart. 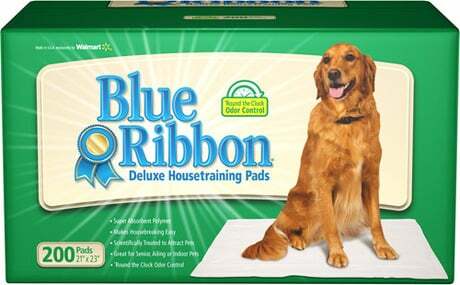 This time, also sticking to Walmart’s selection was Blue Ribbon Deluxe Housetraining Pads, 32 count. The price was about 30 percent more than the super economical brand. But was it worth it? Well… the size of the pads are the same. I do like how the pads look just like diapers being all white. Personally I think they smell a little better than the others. And they are made in the USA! Big plus in my book. What did my puppy think? he used them the same as the super economy brand. I don’t think they were more attractive to him what so ever. One downside is that the plastic seems to repel pee more than the super economy brands. With that I did notice that the pads seemed a little more wet than the economy ones. But, that could be because my puppy is growing and hence peeing more. Anyway, if aesthetics are important to you, spend the additional 30% for Blue Ribbon. If not, go with the super economical brand. They both work great. Blue Ribbon is available exclusively at Walmart. Prices vary from store to store.